Shop Gibson Pump Polish and Cloth Combo from AMS and enjoy Fast & Free Shipping. Keep that beautiful instrument that Gibson has created for you with their authentic guitar care products. 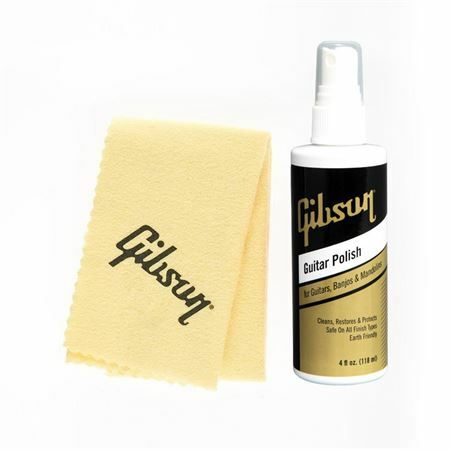 All Gibson Instrument Care products are exclusively formulated to be used on all nitro cellulose lacquer finishes. Everything you need to keep your instrument clean and shiny is right here. The combination of Gibson’s Pump Polish and the Standard Polish Cloth will keep your favorite guitars, banjos and mandolins looking, feeling and playing like new. Gibson recommends that you use only genuine Gibson products to keep your instruments in tip-top condition. All Gibson Instrument Care products are exclusively formulated to be used on all nitro cellulose lacquer finishes. Doesn't seem quite as good as my old aerosol can of Gibson Polish. The product works well, but I don't think it is quite as good as the Gibson Polish they used to market in a small black aerosol can. Of course after nearly 30 years, who knows. I would recommend this polish to others. very good quality item, shines my Gibson great!